We saw this woman in the mall on Black Friday. My favorite part is, it’s not like she just rolled out of bed and took off to hit the stores. She put on makeup, pulled on a nice pair of boots and grabbed her designer handbag! 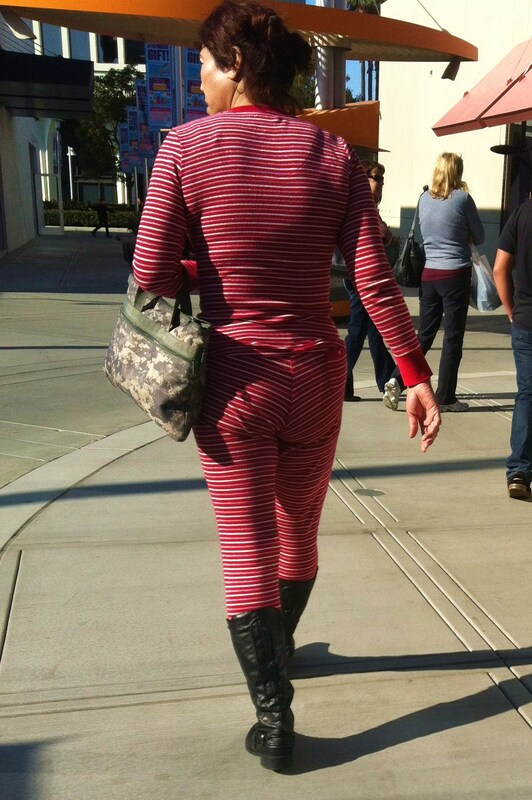 She made a calculated decision to go shopping in her pajamas! She did this on purpose! I wondered if she had some kind of clothing malfunction and had to change into the PJ’s, but nixed that notion when I saw her browsing a store about an hour after we snapped this pic while laughing hysterically… bless her sweet little heart. I really can’t imagine having the guts to do this… I have a hard time going to the grocery store without makeup. Tulsa is a small town; I never know who I might see. But this woman really impressed me with her chutzpah. I looked down at my jeans, sweatshirt, and tennis shoes, all carefully chosen for comfort and functionality, all chosen to merge seamlessly with frenzied early morning shoppers, and I realized, why not just own it? So, I checked my lipgloss, fluffed my ponytail, lifted up my chin, and made a decision… whatever I do, I’m just going to own it, sweetie. I’m writing a book, so I’m not allowed on FB much…therefore, I’ve missed your wisdom and wit. This one is a hoot! You are a delight! FYI: at age 60, I’m finally brave…enough. I (just this year) answer my front door with or without make-up, and I don’t care. I also run out to my mailbox without make-up, some days. I did it today. I’m cute either way, but yes cuter with make-up. I sometimes look ill (when I’m not) wihout color on my face. Like my pastor says, “any old barn looks better with a fresh coat of paint.” Some days I let my face breathe, you know. I’m free! Love you ♪♫♪♫♪♫♪♫.